As many food traditions as there are for Christmas, New Year's celebrations have always had a somewhat less significant and much less 'strict' array of dishes on offer (at least in my family). I suppose most people cook so much for Christmas that by the time it's New Year's everyone feels like something easy and quick, yet celebratory food for the occasion. In my family we often prepared some light salads, different kinds of herring and finger foods. Here in Australia I haven't yet quite figured out what dishes 'should' be on the New Year's Eve menu. 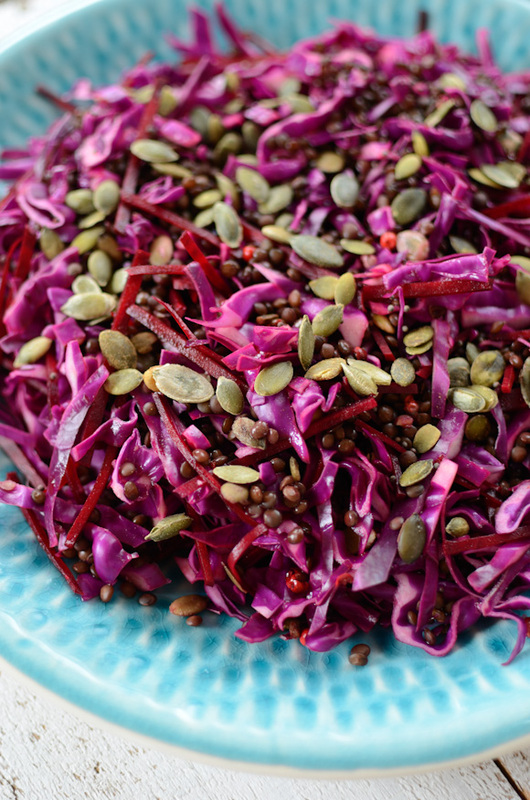 This red cabbage and lentil salad may not be traditional, but I certainly wouldn't mind including it in my (yet non-existing) New Year's repertoire. I adore the deep, rich colours and the mild flavours perfect to accompany any other dish you may want to have on the table. This makes a big batch suitable to be scooped on a big platter and shared amongst friends. 1. Cook the beluga lentils in plenty of water until just tender (about 20 minutes). Drain and place in a large mixing bowl. 2. 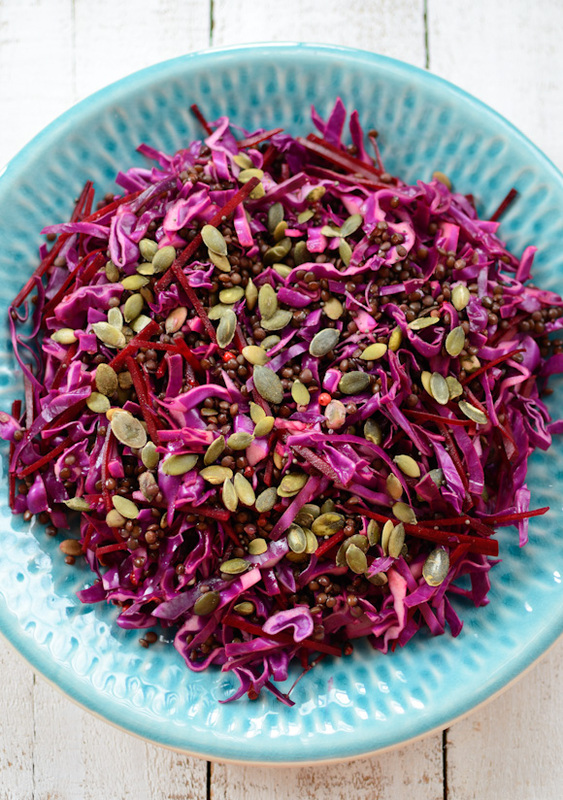 Thinly slice the cabbage and julienne the beetroot. Add in to the bowl and toss well with the lentils. 3. Add in vinegar and oil and the red peppercorns. 4. Place the pepitas, mustard seeds and celery seed in a dry frying pan. Season with salt and toast for a few minutes on medium heat until the mustard seeds start to 'pop'. Add the mixture into the bowl with the rest of the ingredients and toss well to combine. So colorful! A beautiful salad. Ihana punakaalisalaatti! Punakaali on muutenkin suosikkejani:) Hyvää Uutta Vuotta Maria! Yum! Great healthy and quick salad :) love it! this is by far the most unique salad i've ever seen, and it's so colorful too. nice one, maria! Just beautiful Maria, so vibrant. Happy New Year! is the beetrot cooked ? No, the beetroot is raw. Just slice it really finely and you'll get great flavour and texture!